His second marriage was to Paula Sue Dickinson h/2. James Colin Vincent married Jonni Renee Council in Jul 11, 1999. Sandra Ruth Cotter married James Russell Dickinson, son of James Franklin Dickinson and Charlene Hawkins. Denise Marie Cote married James Russell Dickinson, son of James Franklin Dickinson and Charlene Hawkins, in Oct 6, 1982 at Cape Canaveral, FL, USA. Carey Lynne Dickinson married Scott Watkins. Her second marriage was to Lacey Thomas. Carey Lynne Dickinson married Samuel Smith. His second marriage was to Carey Lynne Dickinson. Chad Wesley Curtis married Robyn Erin Houghton, daughter of Robert Aron Houghton and Pamela Rose Rowe, in Feb 24, 1996. George B. Houghton married Hannah Jane Read in Oct 2, 1866 at Kane Co., IL, USA, Lic. 5624. 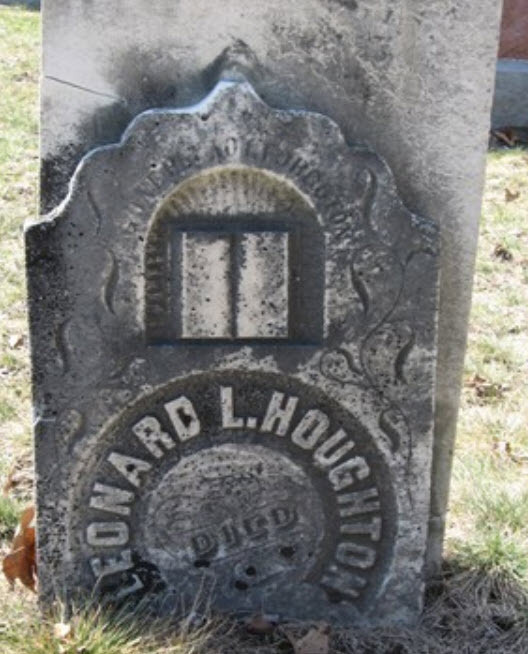 Leonard L. Houghton married Theoda A. Gove in Feb 22, 1868 at Cohoctah, MI, USA, age 29 and 16. Leonard L. Houghton married Anna Black In Civil War pension and 1870 census. Malechi Haughton married Nancy Ann Smith in Sep 29, 1859 at San Augustine, TX, USA.